We all know how important it is to get quality sleep on a regular basis. Those of us who struggle to sleep know only too well the variety of issues this can cause. Whether you are struggling to sleep because of your snoring or whether it is due to a partner’s snoring, it is important to take action – by visiting a sleep center. You will find low-cost snoring aids on the market that may be worth trying. 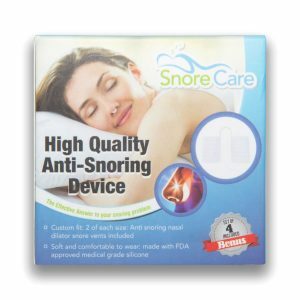 These provide an easy but effective means of reducing snoring, which in turn equates to quality sleep. 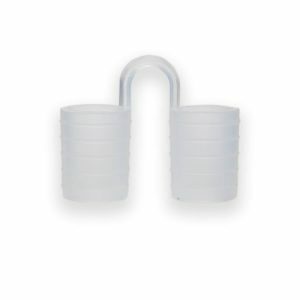 One of the products is a nose vent device called SnoreCare. The product is manufactured by a small company called Trifore Inc., which operates via Amazon. However, there is little additional information about this company online and no way to tell if it is made in the U.S., Europe, China, or some other nation. There is also no information regarding where the product is manufactured. Based on contact information, it could be in the United States or China. It does appear the manufacturer operates exclusively on Amazon and the product has sold well. There are thousands of customer reviews, many of which are rated at 4-star and 5-stars. By opening the airways, nasal dilators such as SnoreCare can improve breathing. The idea behind this device is very simple, as you just insert it before sleeping and in theory, it should stay in all night. Who can benefit from SnoreCare? 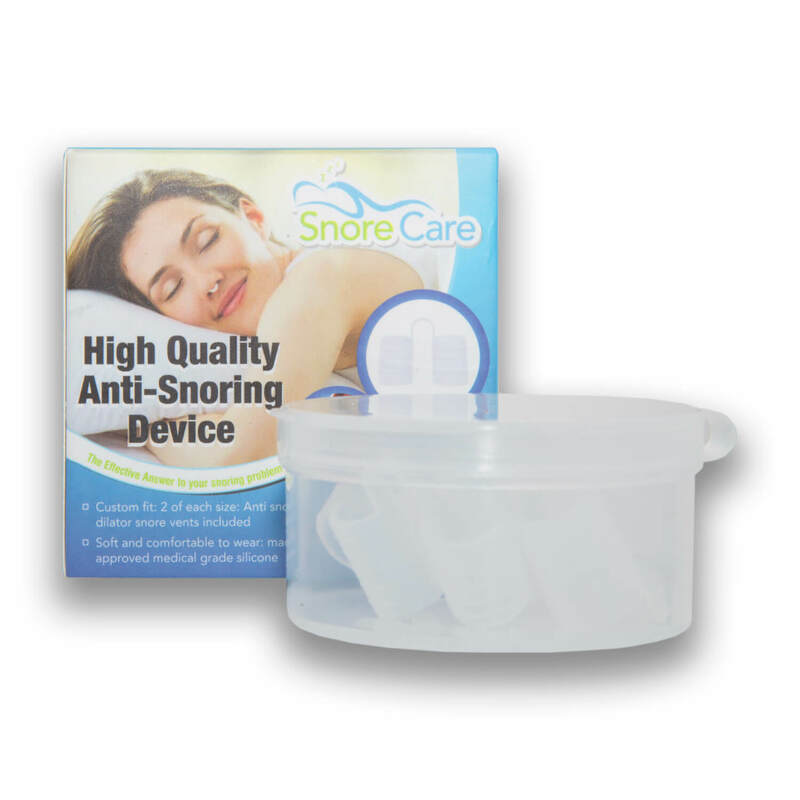 SnoreCare nose vents and other similar products are designed for those who experience regular problems with snoring. By improving breathing and reducing snoring, the product should help you to get a better night’s sleep. In addition, your partner, or anyone sharing the room with you, can benefit from improved sleep. The idea and concept behind SnoreCare is simple and should be effective. However, my personal experience with this product was not as good as the top nasal dilators I’ve tested. I placed my order through Amazon, as it is an Amazon Choice product. The cost of the dilators was $16.95, and I received four nose vents. UPDATE: This product no longer appears to be sold on Amazon, view our best snoring devices here. When the product arrived, it came with a handy travel case. I opened the package, and as expected there were four nose vents altogether. Two of them had rings on the outside to enhance comfort while the other two did not have this feature. There were two vent sizes to cater for different requirements. The nose vents were made from the standard silicone material. Upon removing the vents from the packing, I noticed they were very soft and flexible. On the first night, I decided to try the large nose vents. One thing I will point out is the large ones do seem to be excessively large so they may not be a good fit for most people. When I inserted the large nose vents, I noticed a smell like mint. I did find them a little difficult and painful to insert due to the large size – they didn’t seem to fit into my nostrils properly. However, I thought they might be more effective in reducing my snoring so I persevered. After inserting the vents, I did get used to having them in really quickly. The minty smell was still there but there was no pain or discomfort. There was a wind tunnel noise when I breathed out while wearing the vents – this was far better than the noise from snoring. In the morning, it was a relief to take the SnoreCare vents out. The fit of the large vents was not very good, and as a result, they had been hanging loose for most of the night. However, they must have provided some benefit because the results on my snoring app were better than average. On the second night of using this product, I decided to try out the smaller SnoreCare vents. They had a ribbed design and felt pretty much the same as the larger ones. When I inserted the vents, I experienced a cold sensation. I’ve found this is a common effect with dilators and is the result of increased pressure on the inner nose ducts. I found the smaller vents far easier and more comfortable than the large ones. I slept much better and didn’t notice I was wearing them after a short while. They were far better suited to my nostrils and they stayed in place during the night. On the downside, the smaller vents did not appear to have much of an impact on my snoring. In the morning, I checked my snoring app and found there had been no reduction in my snoring levels. In fact, over the course of the night my snoring was 46 percent of the night. I found the SnoreCare Nose Vents did not work consistently me. The large ones caused discomfort and were a poor fit. The small ones felt better but did not have any positive effect on my snoring. I also thought they were quite costly. Although there were plenty of positive Amazon reviews, they cannot be verified. These reviews did not reflect my personal experience with this product. I’m also concerned I couldn’t find out much about the manufacturer. 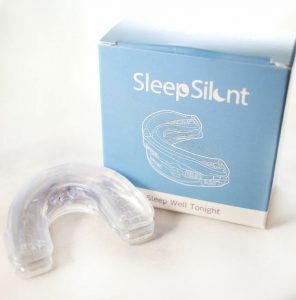 I personally use a snore guard, such as the zQuiet, for my nightly snoring issues.